Grandpa Spurgeon | Brian Jane's Blog. Lori, Grandpa, Rooti and me at Donner Lake, Calif.
A friend told me to blog about my Thanksgiving memories. Instead, I decided to blog about a man I saw every Thanksgiving for most of 35 years, before he passed away. 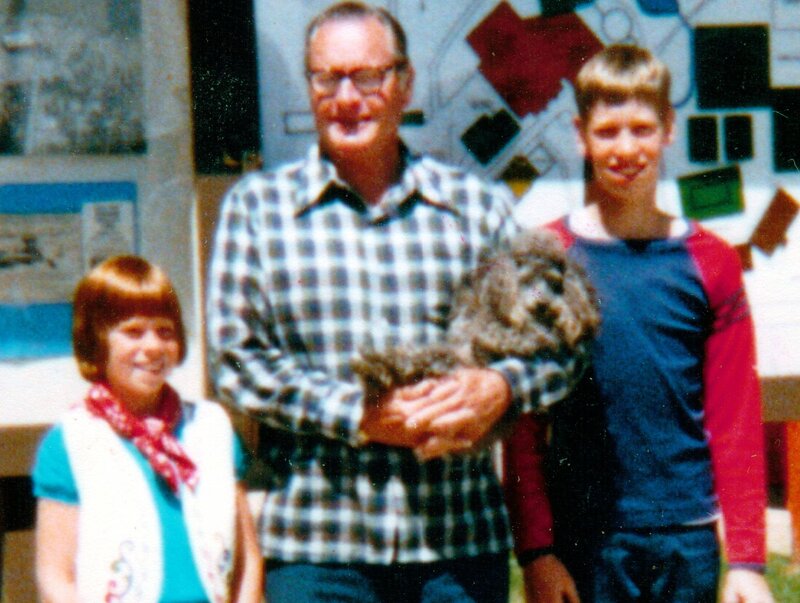 My Grandfather, Stanley Lucius “Spike” Spurgeon, and LaDeanne Blanche “Chick” Spurgeon, and their toy poodle Rooti, would make the trip from Sacramento to visit us in Pistol River either every year around November. Grandpa was, well, to call him a neat freak would make Tony Shaloub’s detective Monk look a little disorganized. The week before his visit, we would begin a deep cleaning of the house. No matter what we did, he would always find something to nitpick. My aunt and uncle were jokingly less kind to him. They would go around the house and make sure every picture in the house was slightly askew. Aunt Donna would laugh “It gives him something to do while he’s here!” I’d literally seen grandpa get out a level to fix pictures, muttering to himself all the while. Perfection, you see, WAS possible in his eyes. In ours, it was nearly pathological. He made us scrape down the shower with a squeegee when we were done. We had to use clean towels every day, rather than the one-towel-a-week that seemed so much simpler to my child-mind. He had a chandelier fixed with fishing twine, hanging at a funny angle, so it would be directly over the kitchen table, without anyone running the risk of bumping the walls with the kitchen chairs. Hallway rugs had stickem under them so they wouldn’t move from normal daily wear. 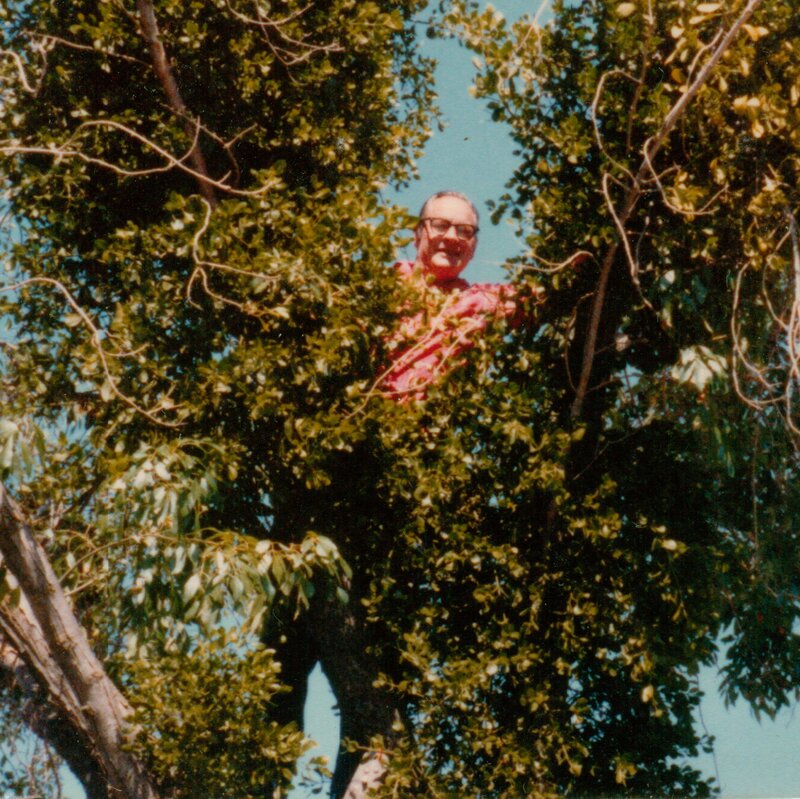 We spent many summers at donner lake picking up sticks and pine cones to make the forest near his cabin look neater. These are just a few of his “neat freak” quirks I remember being subjected to as a kid. 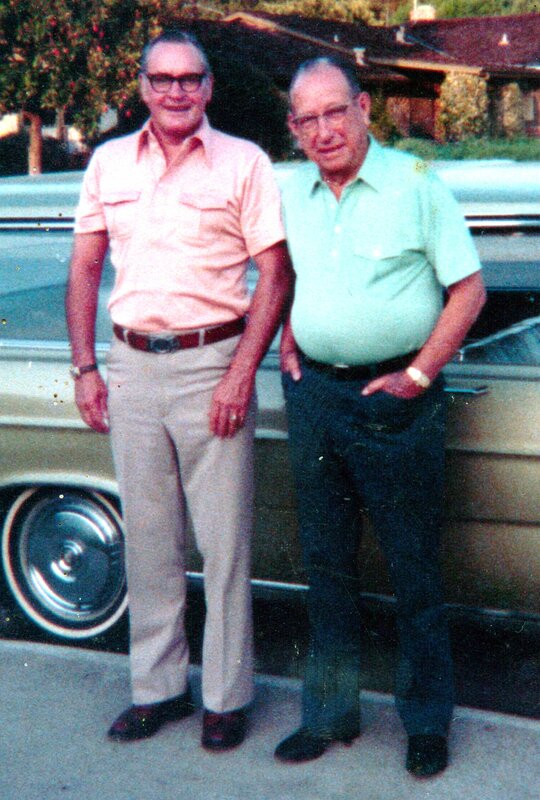 Grandpa Spurgeon with his Uncle Ed Nissen. Grandpa owned 2 homes the entire time I knew him. The first was on Hampton Rd in the Arden District of Sacramento. He bought this home when my mother was a baby, and spent years as a telephone maintenance man for Ma Bell (back when they would go around and actually fix a client’s telephone). He retired in the mid-to-late 70s and–now there was a man who relaxed. Kept a well manicured lawn, and a house full of tidiness. But he wouldn’t get up to do any of this until it was 10 AM. Granny was usually up by 7, and would have downed a pot or 2 of coffee before we’d hear him whistling in the bathroom. Yes, he whistled. And he sang made-up-words in his loud, very 50s-sounding voice. “I’m Shavin’ Mah Boy!” He’d sing. “Doo doo doooooo. Shavin’ shavin’ shavin’…” Then he’d holler “What’s for breakfast? Eggs? Mmmmmm. I love eggs!” He was always the center of attention. He delighted in it, and usually we kids would delight in his good-humor. 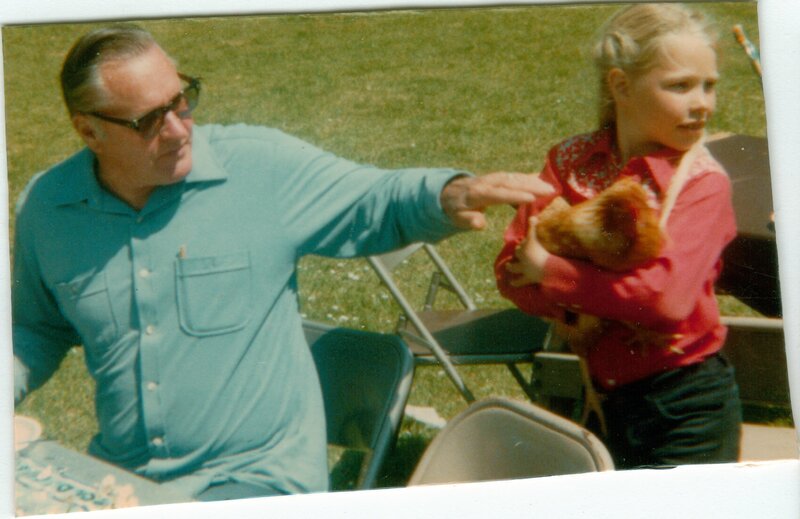 Grandpa, my cousin Tammy, and her pet chicken. Grandpa loved to have his family around him, and to smile and to laugh. He’d occasionally poke fun, and get on peoples’ nerves (ok, mine…) When I began taking piano, he’d announce “Practice practice practice! I’ll be your agent! We’ll be rich, mah boy! Rich! So practice practice practice!” I’d hear this dozens of times every visit. He was my biggest fan. Grandpa and Rooti the poodle. 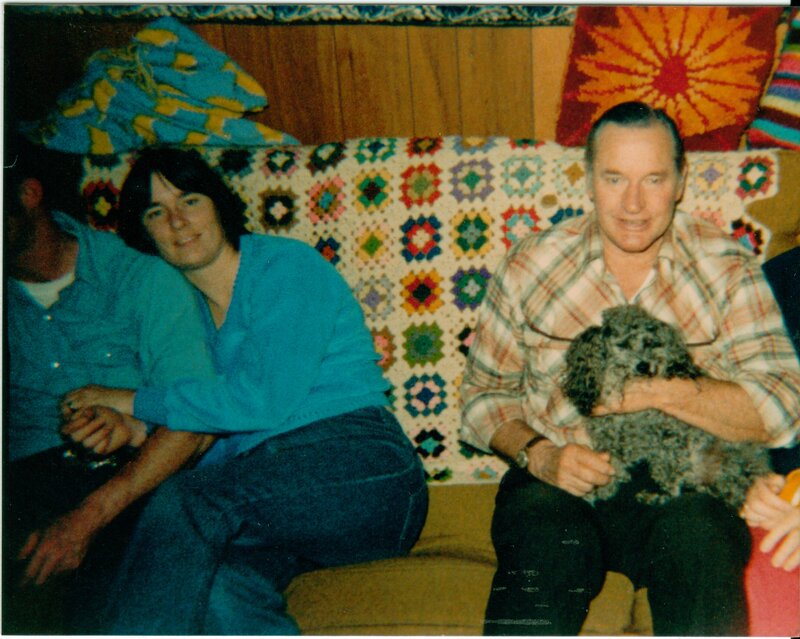 Grandpa had a dog called Rooti, who lived with Aunt Donna & Uncle Neil. He didn’t do too well in Alaska, so went to live with a reluctant Grandpa, who… well, animals in the house were NOT something he did well. Well, you can bet that within days, Rooti was his little boy. He carried the dog everywhere (“Spoilt,” my dad would say, shaking his head). Rooti was more catlike in his personality. He could care less whether you were in his house, or walking you. He went in restaurants, in stores, into casinos with grandpa. Grandpa would introduce him to shopkeepers. “Have you met my son? Don’t you love his beard?” he’d beam. Grandpa Spurgeon at his 35th Wedding Anniversary. You’d think that Grandpa would be a tightwad, but nothing was further from the truth. His kids would regularly get $500 or $1000 Ghristmas gifts. He would take the whole family to Chinese food or, on special occasions, to prime rib dinner. It played into his center-of-attention personality. Waitresses loved him, and he loved them. He’d know them by name and, until his much-later years, would down bourbon and 7-up, Screwdrivers (you know–“man” drinks) and become, if this is believable, even louder and slightly *more* fun. His birthday was right after Christmas, and we would often get fresh crab off the docks at Gold Beach, and have a family cracked crab feast with rolls, pies and of course the obligatory birthday cake. 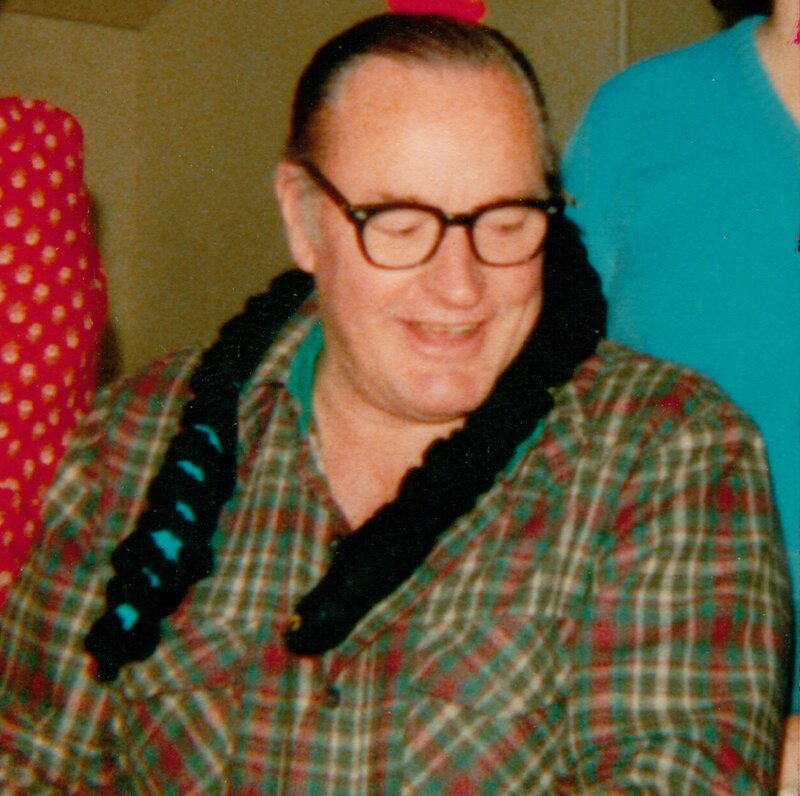 He would carefully open his presents with a pen knife that he always kept very sharp, so we could “save all that wrapping paper for next year.” We usually threw it away right after he left, of course, but it was just one of Grandpa’s quirks. He saw a bird’s nest up in a tree and decided to rescue it. He never talked about his past. It’s not that he lived in the present–I think the past was just too painful. His father insisted, loudly at times, that Grandpa was not his real son (even though they shared a remarkable resemblance). When he joined the Navy and served aboard a destroyer during World War II, he returned to find that all his things had been given to his sister’s boyfriend. “We didn’t think you’d live through the war, so, you know…” was his only moment of apology that he ever heard. He wasn’t religious; in fact, I hardly remember him going to church at all, and only for special productions that the grandkids would be in. My mother remembers Grandpa’s hardworking Danish mother, scrubbing dishes and singing “Bringing in the Sheaves.” She was a Baptist, every pound of her, and nobody would sway her from her faith. Yet Grandpa was lost to the Faith somehow. He’d have been 91 this Thanksgiving. He was in a lot of pain during his last decade. He had no feeling in either of his feet, but still managed to walk, and bike, albeit carefully. He went through a couple bouts of colon cancer, and had only about a foot of colon by the time doctors had finished his surgeries. Still, I remember him humming around the house, his voice quavering either because of pain, or maybe from old age, still humming in the bathroom as he got up and did his morning shaving. By then he was mostly deaf, so would turn on Bernie Ward from KGO, and crank up the radio so he could hear the show. “Important stuff, minding your money. Very important, mah boy…” he would say. One day, just before leaving on a quick visit, he asked me what the recommended tire pressure was for the car we were driving. “I don’t know,” I admitted. We had to sit in his driveway while he found out, and checked the tire pressure for each of our tires, before he let us head back to Santa Cruz. He died in 2001, just before Thanksgiving, after several painful weeks in the hospital. I played at his funeral. He would have liked that. The whole time, I swear I could hear him telling me to “practice practice practice” because someday he would be my agent. He was quite a fella, mah boy. Quite a fella. Pingback: Just Slightly Off Plumb | Brian Jane's Blog. Made me cry. I love seeing my Daddy through your eyes! Thank you Brian.